Here are some of the open-access resources that our lab has made available to the research community. In collaboration with the McGrath lab at Georgia Tech, we characterized the evolutionary relationship of each cichlid protein to previously sequenced animal species. We used the Treefam database, a set of preexisting protein phylogenies built using 109 previously sequenced genomes, to identify Treefam families for each protein annotated from four cichlid species: Metriaclima zebra, Astatotilapia burtoni, Pundamilia nyererei and Neolamporologus brichardi. 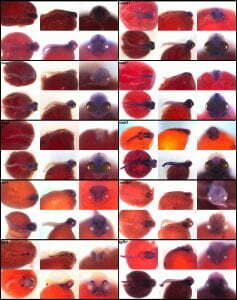 For each of these Treefam families, we built new protein phylogenies containing each of the cichlid protein hits. Using these new phylogenies we identified the evolutionary relationship of each cichlid protein to its nearest human and zebrafish protein. These phylogenies will be useful for any cichlid researchers trying to predict biological and protein function for a given cichlid gene, understanding the evolutionary history of a given cichlid gene, identifying recently duplicated cichlid genes, or performing genome-wide analysis in cichlids that relies on using databases generated from other species. 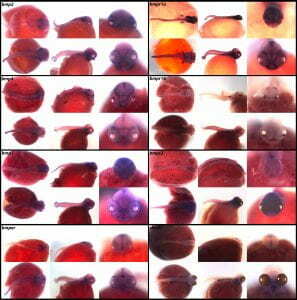 We’ve assemble a compendium of gene expression for Lake Malawi cichlids, across pharyngula (the phylotypic stage) and larval stages of development, encompassing hundreds of gene transcripts. We chart patterns of expression in Bone morphogenetic protein (BMP), Fibroblast growth factor (FGF), Hedgehog (Hh), Notch and Wingless (Wnt) signaling pathways, as well as genes involved in neurogenesis, calcium and endocrine signaling, stem cell biology, and numerous homeobox (Hox) factors—in three planes using whole-mount in situ hybridization. Because of low sequence divergence across the Malawi cichlid assemblage, the probes we employ are broadly applicable in hundreds of species. We tabulate gene expression across general tissue domains, and highlight examples of unexpected expression patterns.